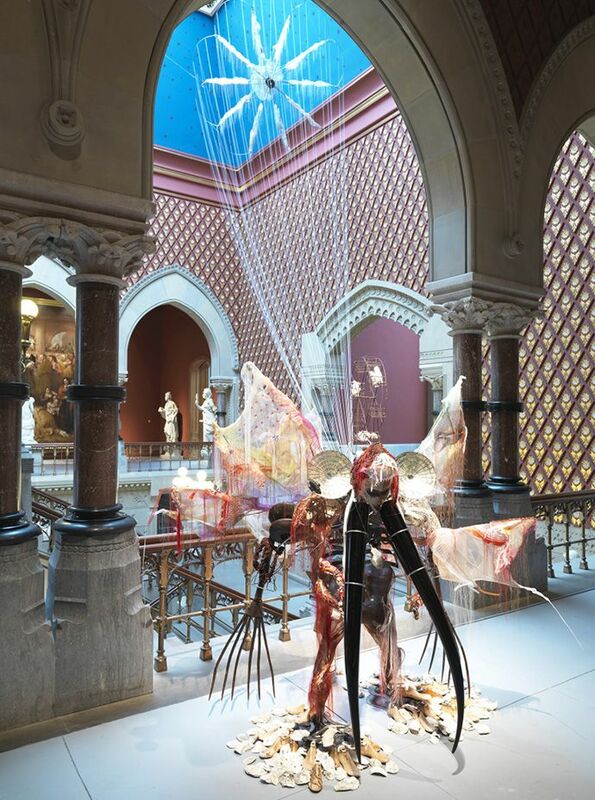 The art of Rina Banerjee takes the logic of a cabinet of curiosities and flips it over—“almost literally,” said Serena Qui in Art in America. Instead of forcing a sense of order on disparate objects, the Indian-born American artist uses sundry man-made and natural materials to create diaphanous but “spectacularly imposing” sculptural installations that insist on the world’s complexity. Some two dozen of them are now scattered about the Pennsylvania Academy of the Fine Arts’ flagship 1876 building, initiating a lively dialogue with the institution’s permanent collection of stately American and European paintings. “It is jarring, for example, to look through an archway bracketed by two monumental portraits of George Washington and see The Promise of Self-Rule,” a Banerjee work in which a length of mesh netting hangs from a broken parasol and the skeletal remains of a Victorian-era chair. As usual, she is staging a collision of cultures, contesting the very idea of cultural purity.